I had a special request for some Jalapeno Jelly this week. It’s so easy to make and so good that I wanted to share it with anyone else who might want to give it a go. Hope you enjoy! 1. Half Jalapeno peppers and remove the seeds of two of the peppers (for hotter jelly leave seeds from two or all three of the peppers). 2. Cut the green and red peppers into small pieces. 3. Place all the peppers into a blender and chop. 4. Place pepper mixture, vinegar and sugar into a 5 quart pan and bring to a boil. 5. Boil rapidly for 3 minutes, stirring constantly. Then remove from heat and cool for 5 minutes. 6. Add pectin and stir until it is well mixed, then allow to cool for 2 minutes. 7. Stir well again for about a minute to ensure that the pectin is well mixed. Then pour into prepared jars and into the water bath for 10 minutes. This recipe makes about 5 half pint jars. It is so easy and so good. One of my favorite ways to eat it is with a little bit of cream cheese on wheat crackers. My brother loves it on a turkey sandwich. Try lots of different things and see what you love it with. I can’t begin to say how good this jelly is. I love plum jelly but I REALLY loved this one. I was lucky enough to have two plum trees that were ripe and full of plums. I could have all I wanted to come and pick. And I am very grateful. 1. 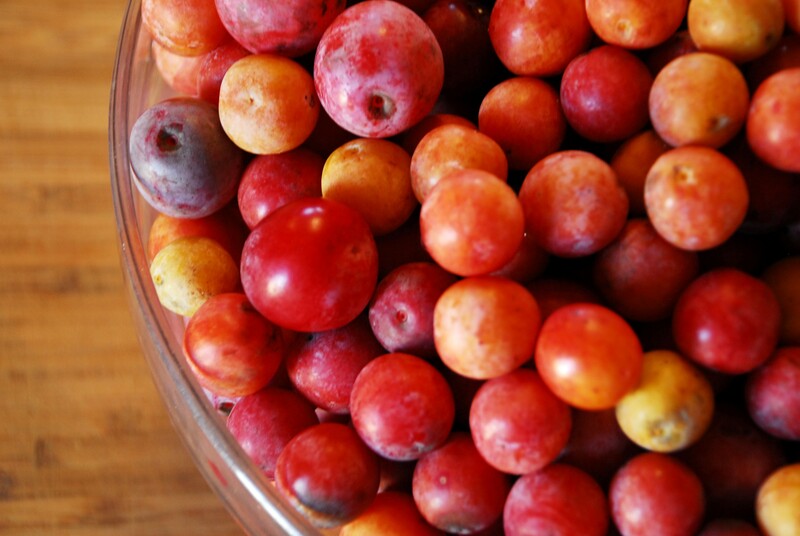 Place plums and water in a large stockpot and bring to a boil. 2. Once boiling reduce heat to simmer. 3. Allow to simmer for 30 mins. 4. Line a strainer with 4 layers of cheesecloth. 5. 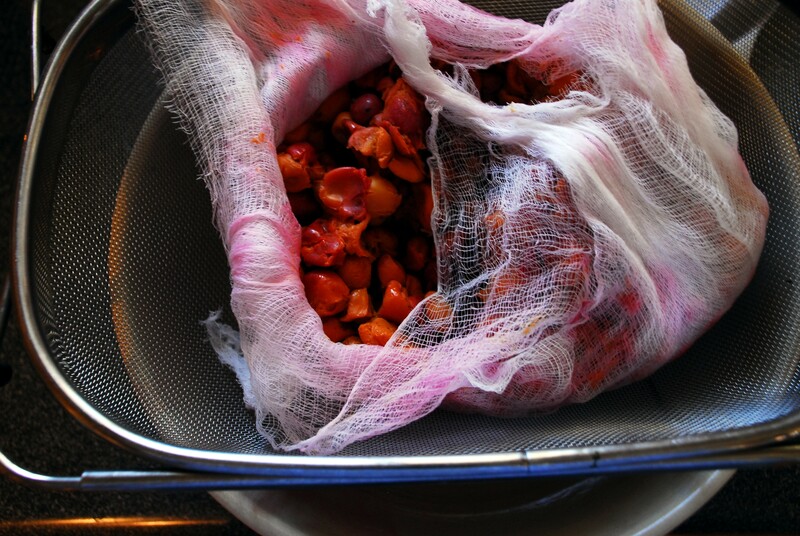 Place plum mixture in strainer for 30 mins or until there is 5 1/2 cups of liquid. 6. Return liquid to pan. 7. 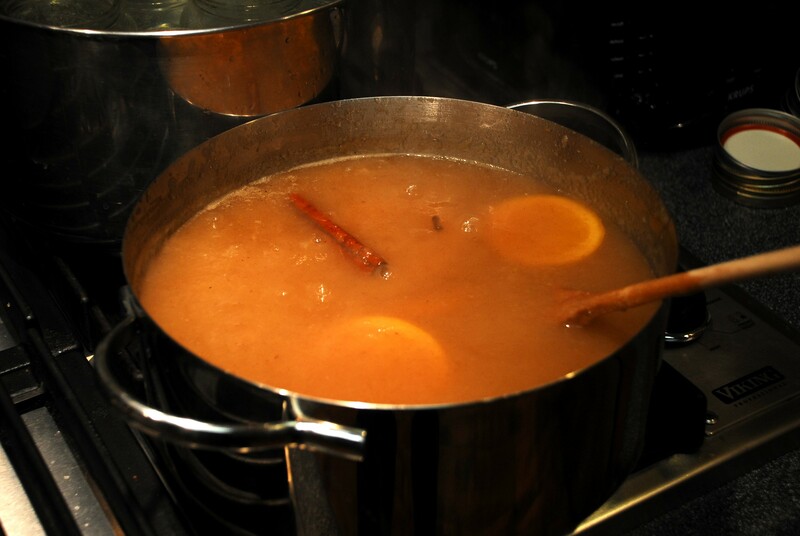 Add pectin to liquid and bring to a boil. 8. Add sugar and bring to a rolling boil. 9. Boil for 1 minute stirring constantly. 10. Remove from heat and skim off any foam. 11. Process as you would any jams or jellies. 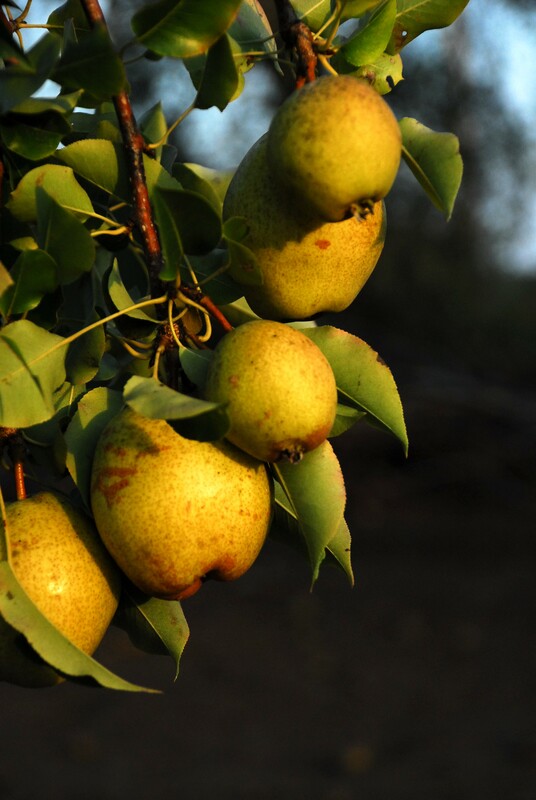 It’s pear season! A friend down the road has a pear tree with an abundant supply and I have gone pear crazy. I decided to start with Pear Butter. If it works with apples why not pears. 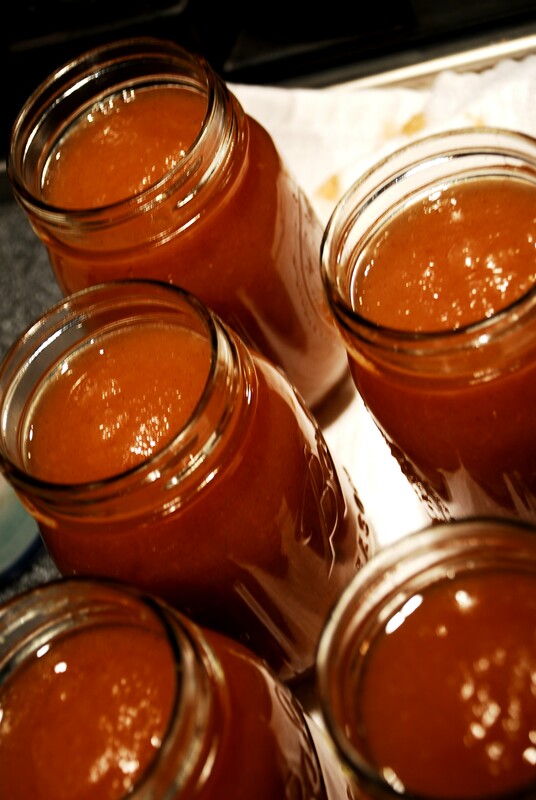 I found some recipes and adapted them into a Red Wine Pear Butter that is delicious. If you like pears poached in red wine you will love this. 1. 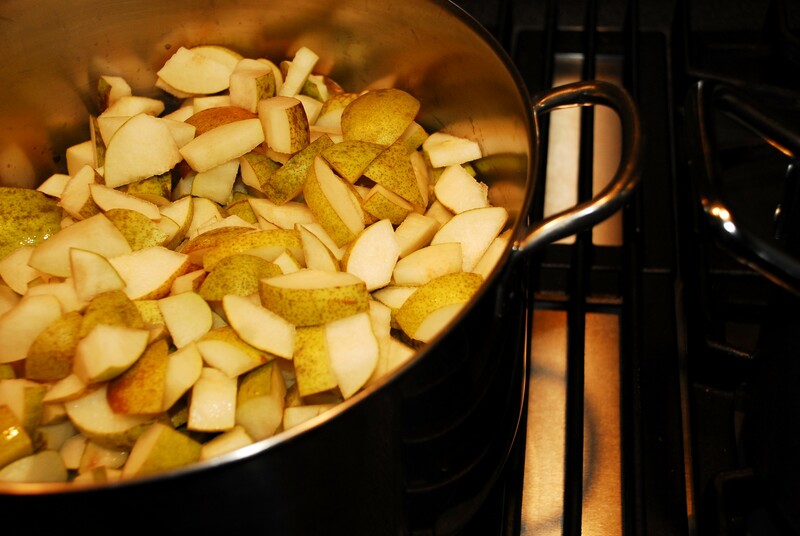 Place cut pears, wine and water into a large pot and bring to a boil. 3. 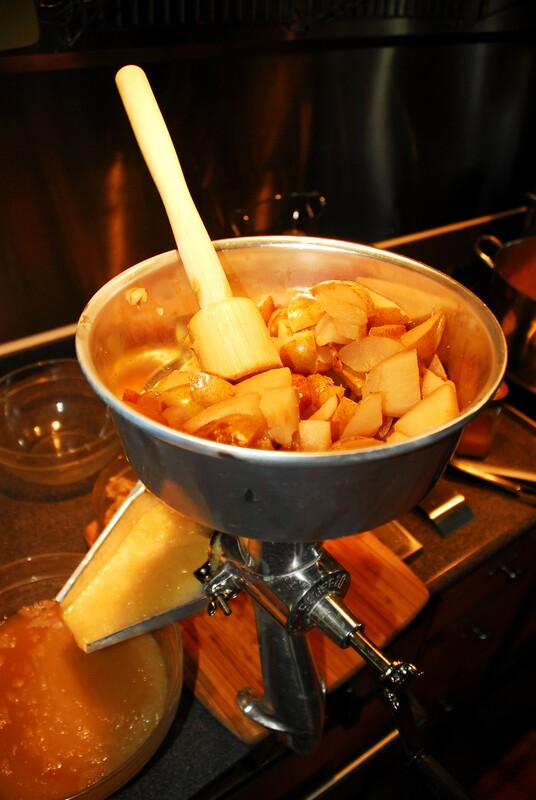 Once pears are cooked press through the food mill or push through a sieve. 4. Return pear puree to large pot and add remaining ingredients. 6. 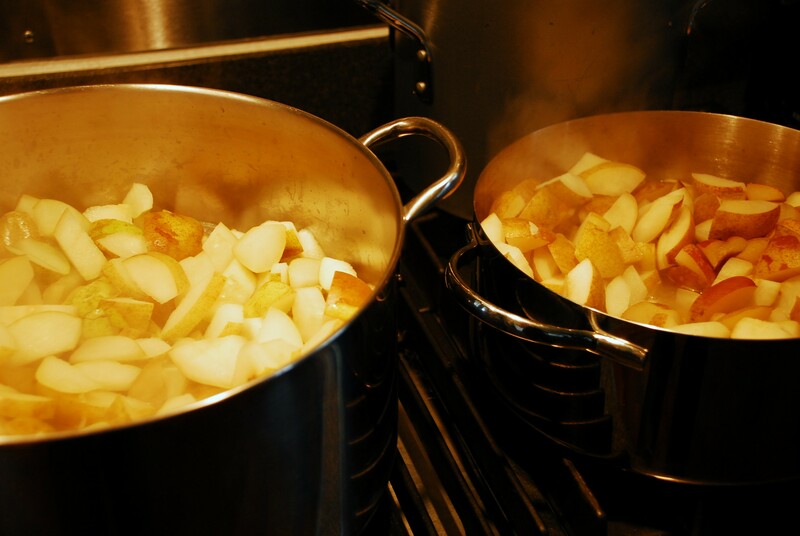 Once boiling reduce heat to low/simmer for 1 to 2 hours depending on batch. 7. You can test your mixture to see if it is done by placing a small amount on a chilled plate. There should me not liquid on around the edges. 8. If canning place finished mixture into sterilized jars and place in a water bath. 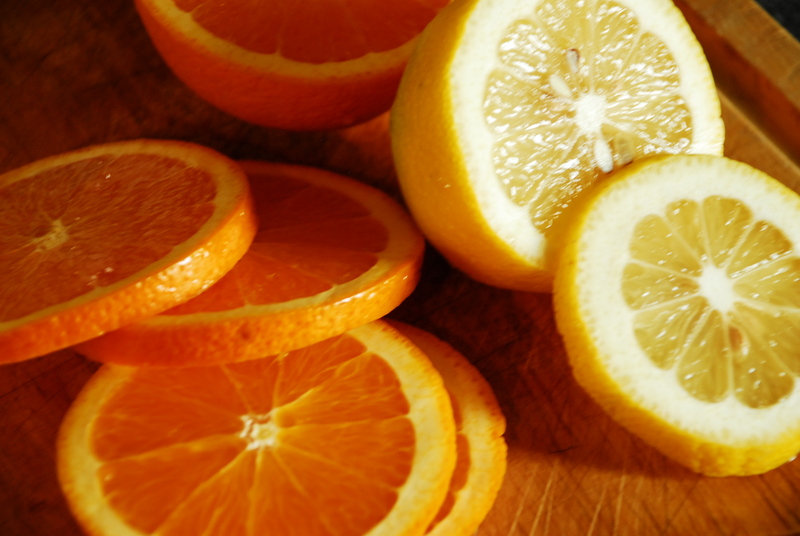 Leave in water bath 10 mins then remove and let cool completely before storing. Pictures from the kitchen below.